New Home Office figures show the number of disability hate crimes recorded by police increased by more than 40 per cent last year. The percentage increase in recorded disability hate crime by police forces across England and Wales was higher than for any other hate crime strand. One disabled campaigner said it was “both a relief and a sadness” to see the figures, as they were beginning to show the true levels of disability hate crime but also demonstrated that years of work to encourage more disabled people to report such offences were paying off. The Home Office figures show there were 3,629 disability hate crimes recorded by police in England and Wales in 2015-16, compared with 2,515 in 2014-15 and only 1,748 in 2011-12, meaning they have more than doubled in just four years. The Home Office said it was possible that some of the increase could be due to an increase in actual disability hate crime, but that improved reporting and recording was likely to be a factor across all the strands of hate crime, including race, religion and sexual orientation. 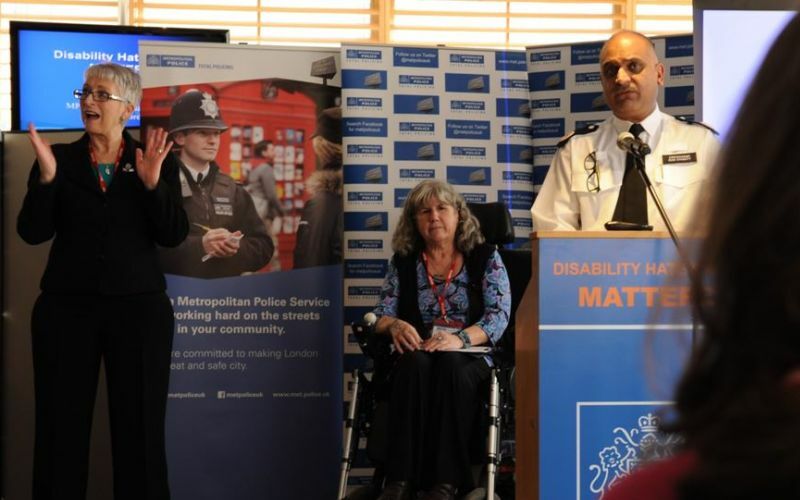 The London-wide Disability Hate Crime Matters initiative, aimed at increasing the reporting and recording of disability hate crime – led jointly by the Metropolitan Police and the pan-London Deaf and disabled people’s organisation Inclusion London – has seen a sharp increase in disability hate crime reported to police since it began rolling out in January. In 2015-16, the Met recorded 357 disability hate crimes, according to the Home Office figures, almost exactly double the 178 recorded the previous year. But the latest figures, shared with Disability News Service by the force, show an even sharper increase, from 228 in the year from September 2014 to August 2015, to 495 in the year from September 2015 to August 2016, an increase of 117 per cent. Despite the new Home Office figures, it is still not clear whether there has been an increase in actual disability hate crimes in recent years. A report by the Equality and Human Rights Commission last month suggested that levels of disability hate crime affecting adults in England and Wales had actually fallen in the years between 2007 and 2014, from an average of 77,000 per year during the period 2007-08 to 2009-10 to an average of 56,000 per year during the period 2011-12 to 2013-14. Despite these figures, analysis of official crime statistics by the charity Victim Support, published in April, showed that while violent crime had fallen by almost half for non-disabled people over the 10 years to 2015-16, over the same period the proportion of disabled people who were victims of violence had increased by 3.7 per cent. The Home Office has previously been criticised for failing to take action to address disability hate crime. In July, disabled campaigners attacked the government’s new four-year hate crime action plan for its “totally disrespectful” failure to address problems around disability-related hostility. Anne Novis, a coordinator of the Disability Hate Crime Network and the independent chair of the Met’s disability hate crime working group, said: “Each year we are experiencing better recording of disability hate crime reports to the police. Novis, who also leads for Inclusion London on disability hate crime, said: “When we have the opportunities to advise and communicate regularly with police officers we can influence and deliver training, change policies and processes that cause barriers for reporting, and work together on improving justice outcomes. “In London since January 2016, due to the Disability Hate Crime Matters initiative rolling out briefings to all officers in London on disability hate crime, we have seen recorded incidents increase significantly. “This improvement evidences what can be achieved when we, the victims, the experts on this issue, are listened to and influence the work on disability hate crime. “Yet at the same time, we do expect increased funding to our own organisations, so we can assist victims and participate in local strategic partnerships, ensure better policies and procedures that make it easy to report hate crime, and legislation that is equal for all victims, so we all can access equality of justice on hate crime. “We also need those in positions of influence to ensure they do nothing that perpetrates hostility or incites others to denigrate and stigmatise Deaf and disabled people, portray us a ‘fraudsters’, ‘benefit cheats’ or a ‘burden on the state’. “The media and government representatives have given a language of ‘hate’ towards Deaf and disabled people which must not be tolerated by anyone. “In my opinion, this language has increased the types of hostility we experience. Stephen Brookes, another coordinator of the network, said it was “both a relief and a sadness to see the substantial increase in recorded disability hate crime in the latest government report”. He said that a third-party reporting centre he is involved with in Preston was recording an average of eight cases per month, over an 18-month period, although many of these were treated as “lower level” reports that were “noted and logged” and dealt with at a community level rather than as crimes. Brookes said there was still a need for “far better use of the existing available elements of law to ensure full justice for disabled people”. He pointed to the lack of consistency in sentencing by the courts and the “abysmal” use of section 146 of the Criminal Justice Act – which increases sentences for crimes involving disability-related hostility – which he said would be “almost laughable if it wasn’t so serious”.